Many mushrooms littering the floor in woodlands this autumn can be easily camouflaged, and hence, easily passed by. But in this case it’s very hard to miss this marvellous and very tasty woodland (mostly with conifers) mushroom. 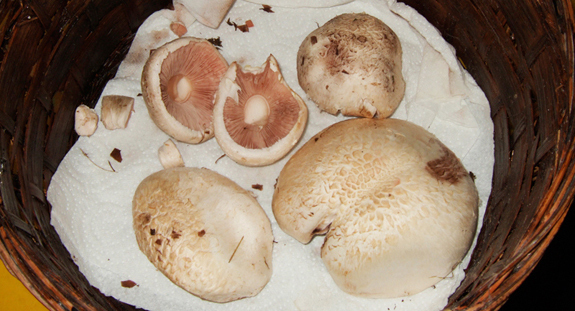 The Prince (Agaricus augustus) earned it’s name (both common and latin) from the Roman emperor. This was his favourite mushroom, and I can’t blame him really. Initially I had confused this mushroom with a typical brown wood mushroom which is understandable. They’re very similar in looks but it’s the sheer size that gives it away. 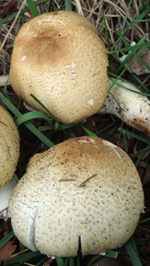 The Prince mushroom mainly can have a cap diametre of up to 20cm. 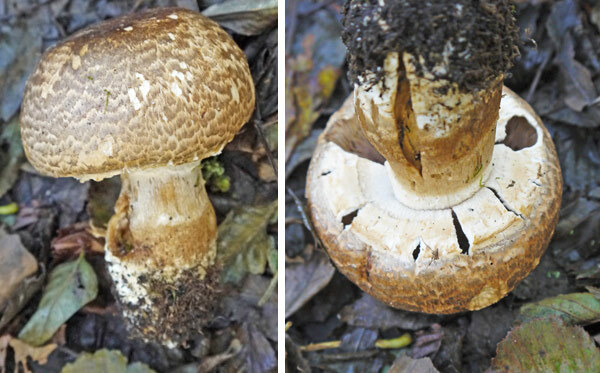 The brown wood mushroom only grows to about 9cm. The largest of the specimens I’d found were in excess of 12cm or more – the maximum size was around the 15cm mark. They’re quite pretty to look at too. The cap is covered with small chestnut-brown fibrous scales and the top remains as a more solid nutty brown colour. 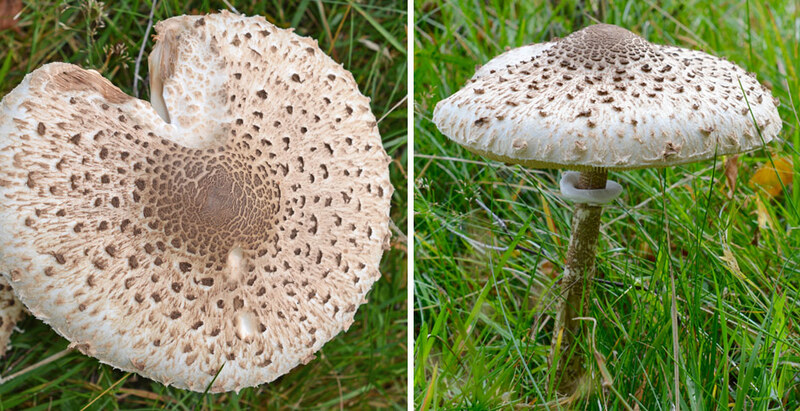 Again, this can add confusion in identification, as it’s been known to be mistaken for a Parasol mushroom, but it doesn’t grow as tall and the gills are white coloured. The picture above shows a small group of particularly young Prince’s. From very young, they are quite ovoid or elliptical (or should I just say egg-shaped!) but as they grow they expand to form a large convex cap. Other tips to identifying this grand mushroom is it’s smell. It dishes out a pleasant odour of almonds – pleasant that is if you like the smell of almonds! The ring on the stem is white an is (or can be) large and pendulous (depending on the age at which you find it). Unfortunately my find had been bashed and maimed at the side of the coniferous woodland path, so vital body parts had been damaged and bashed away! I was going to eat my find, but suddenly had second thoughts as they grew near the edge of the path. A path which I know frequents incontinent dogs and their careless owners. No chips on my shoulder eh! ?